Our Short History by Lauren Grodstein has an almost unbearably sad premise: Karen Neulander, a 40-something political consultant and single mother to a 6 year-old boy named Jake, is dying. She has had a recurrence of ovarian cancer, and is two years into a four-year prognosis. She decides to write a book – a memoir – for Jake, so that he can read it when he is older and understand who his mother was. Well, I read Our Short History, and I made it through to the other side. I didn’t even cry until the last few pages (and no, Karen doesn’t die at the end of the book). It is sad, to be sure, but it’s also well-written and funny at times and not needlessly maudlin. Karen is flawed, but realistically human. She is in a terrible situation and she’s trying to make the best of it. She is a dedicated, diligent mother with large – but not infinite – reserves of patience for her son, and she’s smart and determined. She also happens to have Stage IV cancer, which has thrown her a big curveball. The book opens with Jake asking Karen, once again, to find his father and introduce them to each other. Karen has resisted this request of Jake’s for many years, but he has worn her down, and given her (and his) circumstances, she finally relents. She sends a Facebook message to the man she had dated seven years earlier, whom she had loved but who told her he didn’t want children. Karen doesn’t really think through all of the ramifications of this outreach (which is kind of unlike her) – if Dave wants to see Jake, how often will she let that happen? Will visitation become a regular thing? What rights might he have to custody? Will he try to get custody after Karen dies? Karen may be frustrating at time, even irrational, but I don’t know who wouldn’t be in the same situation. Grodstein has created an utterly realistic depiction of the choices a mother would reasonably make facing her premature death and the care of her beloved son. Karen loves Jake with a ferocity than even she can’t control sometimes, which pushes her to behave in ways she might regret, but which are oh so understandable. So yes, Our Short History is a sad book, and at times Karen’s plight took my breath away. But I appreciate Grodstein’s writing and her storytelling, which made this much more than a tearjerker. I am a fan of her earlier works, and was not disappointed at all by this one. I listened to Our Short History on audio. It was performed by accomplished narrator and EDIWTB friend Karen White, who did a great job with this one. She conveyed (fictional) Karen’s desperation and anger as persuasively as she did Karen’s pride and pettiness. I wonder how hard it was to keep her composure when she got to some of the more difficult scenes in the novel. Overall, excellent audiobook. I also have a copy of A Friend of the Family to give away to an EDIWTB reader. To enter, leave a comment here with your email address, and I will pick a name at random on Thursday, October 14. Thanks to Lauren Grodstein for taking the time to answer my questions and to Algonquin for the copy of the book. Q: This book was one of my favorites of 2009. The question on my mind the whole time was: how did you get yourself into the mindset of a fiftysomething man so convincingly? Did you base the book on someone you know? A: Pete really isn't based on anyone I know – in fact, I have a hard time writing people I know, since I become so consumed with getting the depiction "right" that I forget I also have to make it good. So Pete was truly a figment of my imagination, although certain things – the doctor stuff especially – was based on some of the experiences of the doctors I know, friends and people in my family. As for how I got into his mindset, I just woke up one day, as corny as it sounds, and Pete's voice was in my head. It was just there, like a radio announcer's. He talked me through the whole manuscript, and when I was done with it, he was gone. It almost felt like transcription though while it was happening, though, like someone was dictating to me the most important details of his life. It was kind of magical even though I don't really believe writing is magic. Q. As a parent, watching Pete lose control over his son's future was extremely disturbing. Is this a cautionary tale for parents, with the moral being that in the end, we are powerless over our children's destinies? A: I try not to write cautionary tales, or write stories with any particular moral or meaning. All I ask of my novels is that they entertain, that they make the reader want to keep turning pages. If people find some lessons in them, that's terrific, but it's not what I ever set out to do. A: Ah – I love so so many different writers! Philip Roth, Richard Ford, Evan S. Connell, Elizabeth Strout, Zadie Smith – and then also Virginia Woolf, Edith Wharton, Ring Lardner, MFK Fisher. And I love mystery novels and I read cookbooks like they're thrillers, and also, with my two year old, I've rediscovered my love of Richard Scarry and Dr. Seuss. Q. I'd love to hear about how you plotted A Friend of the Family, which I thought was perfectly paced. Did you have the whole story outlined from the start, or did you let it develop as you wrote? A: I always work with a rough outline, and as I'm finishing one chapter I'm sketching out the next. But the plot of Friend was, in some ways, really just a series of flashbacks, and I wrote them in a sort of piecemeal way, and then had to rejigger them after I'd finished my first few drafts so that they'd make more sense to the reader. Q. What is your writing process like? Do you write for the same amount of time every day, or do you let inspiration strike when it may? A: When I'm in the middle of a novel, I'm all about page counts. Ten pages a day for that first draft, and if it takes me four hours to write them, great, and if it takes me all day, then I'm going to sit in that chair all day. The ten pages don't have to be any good – and usually they're not – but I worry about that in the second draft. For the first draft, I just want to bang it out so that I can then begin re-drafting, reimagining; for me, that's where the fun stuff really begins. A: A new novel! Right now I've got a Colombian finch, a shoebox full of alcoholic mice, and a famous evolutionary biologist. We'll see where this goes. i just finished a book I enjoyed a great deal – A Friend of the Family by Lauren Grodstein. It’s about Pete Dizinoff, a fiftyish New Jersey doctor with a comfortable life – wife, son, successful practice – who watches it all unravel, mostly of his own doing. It all starts when Pete’s son, who has dropped out of college to pursue his art career, gets involved with the daughter of Pete’s best friend Joe. Laura – the daughter – isn’t who Pete would have chosen for his beloved son. She’s ten years older, but more troubling, she has a terrible skeleton in her closet – a teenage pregnancy that ended horrifically. A Friend of the Family is at its core about the lengths to which parents will go to protect the lives they’ve envisioned for their children. I am not a fifty-year old man, but Lauren Grodstein isn’t either. I was constantly impressed while reading this book with Grodstein’s ability to capture Pete’s thoughts and outlook. The story is told with a great deal of foreboding, which adds tension and drama throughout, and is detailed and compelling. I think Grodstein is an incredibly talented writer. There were a few loose ends at the end of the book that I felt were insufficiently explained, but I otherwise found A Friend of the Family to be very satisfying. I was reminded while reading A Friend of the Family of two other books about parents trying to protect their kids, with often disastrous results – Breaking Her Fall by Stephen Goodwin (reviewed here) and Trespass by Valerie Martin (reviewed here). All three explore the increasing desperation and pain these parents feel as they watch their children slip away, and while their actions are sometimes deplorable, it’s hard not to sympathize with them. 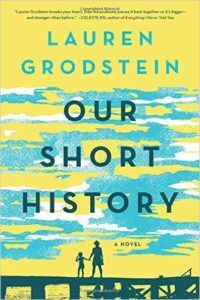 I highly recommend A Friend of the Family and will be checking out Grodstein’s other books! In A Friend of the Family, Lauren Grodstein goes to [great] literary heights with a contemporary suburban drama brewing with an undercurrent of violence that, with each turn of the page, takes on the weight of an American tragedy. As the book opens, Peter Dizinoff, a successful New Jersey doctor, is struggling to adjust to the aftermath of his actions as the foundation of his personal and professional life crack beneath his feet. At the center of his troubles is his beloved son Alec, who deflates his father's high expectations when he drops out of college after just three semesters and moves into the apartment above their garage. And when his son begins seeing Laura, the troubled daughter of Peter's best friend who is ten years older than Alec and lives in the tainted shadow of being acquitted for an unspeakable crime when she was 17, Alec's ambivalence to his father's hopes in living a good life turn into a simmering rage. Dizinoff, a man with a clear definition of right and wrong, flips back and forth in time as he narrates the history of events that build their way to a layered, emotionally wrenching climax. Just from the plot description, this book reminds me somewhat of one that I read a few years ago, Trespass, by Valerie Martin. Similar story about parents watching their dreams for a their child fade away when he becomes involved with someone with a complicated past and a different agenda. (See review here). Beth Fish Reads enjoyed this book: " A Friend of the Family is not a happy novel with easy answers and a clean ending. The characters are multidimensional, and the reader's sympathies change as the book progresses. Grodstein pushes you to question the limits of the trust and faith you have put in your family, your friends, and even your doctors. It's a novel that will make you think." I am excited to read this!